I love crepes, my girls love strawberries and chocolate, so I made this chocolate crepe with strawberries cream cheese filling for breakfast today. The strawberries were big and sweet, all riped yesterday and I had to preserve it and use them later. By adding a little bit sugar, the strawberries released the juice and prolonged the shelf life, turned into a yummy dessert on its own, or you can make it into this delicious breakfast (you can serve it as dessert too). 1. Mix fresh strawberries and sugar, refrigerate until crepes are done or pre-made it the night before. 2. Mix all crepe ingredients together until well blended (no lumps). 3. Heat up non-stick over medium heat, grease with butter, add crepe batter (about 3 tablespoons) in center and spread evenly by swirling the pan. 4. Cook crepe for 10 seconds or until edge is cooked. Flip and cook for 5 seconds, remove and lay flat on a plate. 5. Repeat step 4 – 6, until all batter is gone. Stack cooked crepes on top of each other. 6. Place a crepe on a plate, spread strawberry cream cheese evenly but leave a 1/2 inch edge all around. 7. Add 1 tablespoon strawberries in a straight line (about 1 inch from the edge), fold crepe from both ends of strawberries line, then roll it up like a burrito. 8. Add extra cream cheese and strawberries on top. Serve immediately. 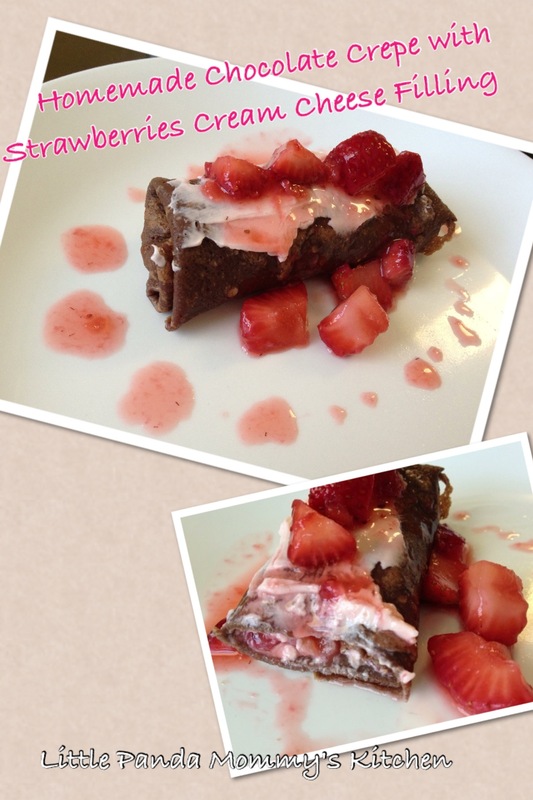 This entry was posted in Breakfast choice, Dessert, Easy Cooking, Healthy Eat, Meal in 30 minutes and tagged Breakfast choice, Dessert, Easy Cooking, Healthy Eat, homemade Chocolate Crepe with Strawberries Cream Cheese Filling Recipe, Meal in 30 minutes. Bookmark the permalink.